settings folder contains two main plugin configuration files. Both files must have valid json formatting and a set of required options. Plugin title. Can be any value, name it something intuitive. description Custom plugin description. May include any info you find necessary. 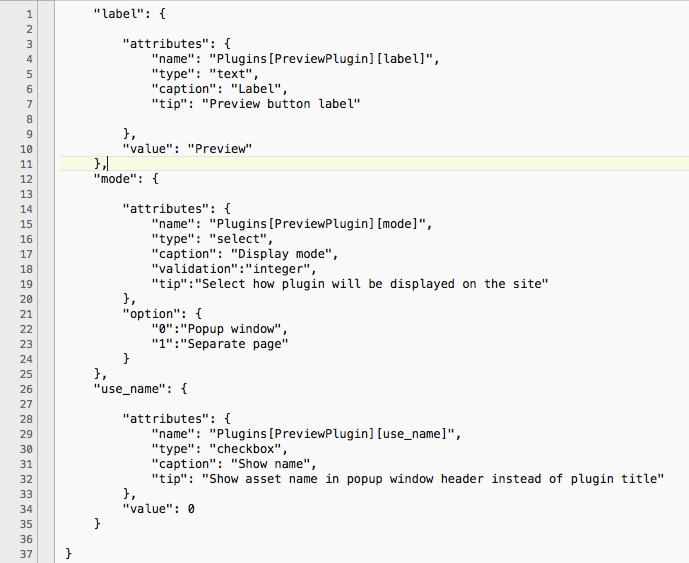 form.json contains plugin settings form, displayed in to “Admin”-> “Sites”-> “Some site”-> “Plugins” tab. In the picture you can see three options formatted according to Elegant 6 API requirements (see plugin options for more info). These options values will be available inside plugin using “getSetting” method (see plugin methods for more info). Each Elegant 6 site can have its own plugin configuration. “views” folder contains view templates that you may utilize for various plugin needs. Template is attached and displayed using YII API (see yii documentation for more info). “PreviewPlugin.php” file contains main plugin class.